It was during their annual winter getaway in Cuba that it happened. Chris and Kaylea took an 11 day trip away from Canada’s dreaded cold to enjoy their favourite beach spots in Cayo Santa Maria. During one of their swims, Chris brought Kaylea over to the edge of the beach where the crystal blue waters merged into the white sparkling sand and wrote into the sand ‘Will you marry me?’ Simple. Sweet. And a complete surprise to Kaylea who had no clue that he would propose during their time away together! With limited internet connection, Chris and Kaylea enjoyed those days as a newly engaged couple all on their own before getting home and sharing their exciting news to family and friends. 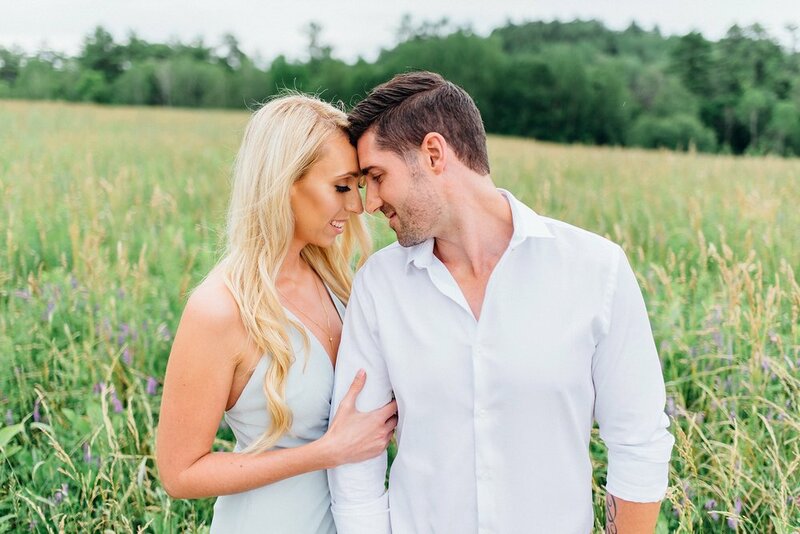 For their engagement shoot, Kaylea suggested that we check out the field in Wakefield. Even though the bugs ate us up and the clouds looked threatening, they were laughing throughout their whole session without a care in the world. The sun even decided to peep through for a few minutes at golden hour. Kaylea, Chris, thank you so much for bringing me along to capture your love story. Ali and I look forward to photographing your wedding next year!